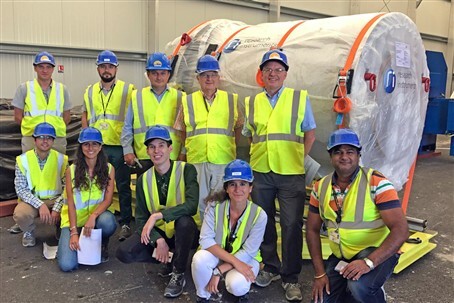 F4E’s vacuum pumping specialists have celebrated an important milestone together with their counterparts from ITER International Organization: the first cryopump has been successfully manufactured following the specifications of the cryopumps to be used in the torus of the machine and cryostat. The component has been delivered on-site and will go through a series of tests. F4E has been responsible for the procurement of this component, which took roughly four years to be manufactured and reached a cost of approximately 3 M EUR. Research Instruments, Alsyom and SDMS are some of the companies that have contributed to this technical achievement with the support of their subcontractors. The equipment which measures 3.4 x 1.8 m and weighs close to 8 T, has been developed in different stages and has been progressively assembled. After the performance testing of this cryopump is successfully completed, eight more will be manufactured under the supervision of F4E. Six of them will be installed in the torus of the ITER device and two in the cryostat. When ITER is operational, the gases resulting from the fusion reaction will be pumped with the help of the six cryopumps from the lower part of the torus to the roughing system, where they will be processed and treated in a closed loop as part of the fuel cycle. Europe is the only party responsible for the production of the cryopumps. The successful completion of the first one will help towards the finalisation of the design of the reaming eight, which are expected to be delivered in 2022.